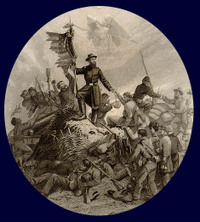 On this Memorial Day weekend when we honor those who served in our nation's wars, I recall my ancestors (both near relations and more distant) who fought during the American Civil War. The predecessor to Memorial Day was Decoration Day, with origins claimed by both North and South and even by the African American community in war-ravaged Charleston, SC. I include in this roster the Confederates in the family as well as those who wore the Federal Blue and fought to preserve the Union (or for personal reasons of their own). Samuel Barker, Jr.: Private, Company G, 37th Wisconsin Volunteer Inf. 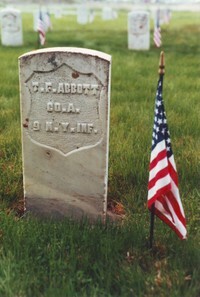 1865 (He enlisted underage in March 1865). William Taylor: Trooper, company A, 1st New York Volunteer Cav. (Lincoln Cavalry) 1861 (fell from horse during training in October 1861 and discharged disabled, died of complications from injury in 1864). "Four score and seven years ago, our fathers brought forth upon this continent a new nation: conceived in liberty, and dedicated to the proposition that all men are created equal. Now we are engaged in a great civil war...testing whether that nation, or any nation so conceived and so dedicated...can long endure. We are met on a great battlefield of that war. We have come to dedicate a portion of that field as a final resting place for those who here gave their lives that that nation might live. It is altogether fitting and proper that we should do this. But in a larger sense, we cannot dedicate...we cannot consecrate...we cannot hallow this ground. The brave men, living and dead, who fought here have consecrated it, far better than our poor power to add or detract. The world will little note, nor long remember, what we say here, but it can never forget what they did here. It is for us the living, rather, to be here dedicated to the unfinished work which they who fought here have thus far so nobly advanced. It is rather for us to be here dedicated to the great task remaining before us...that from these honored dead we take increased devotion to that cause for which they gave the last full measure of devotion...that we here highly resolve that these dead shall not have died in vain...that this nation, under God, shall have a new birth of freedom...and that the government of the people, by the people...for the people...shall not perish from the Earth."